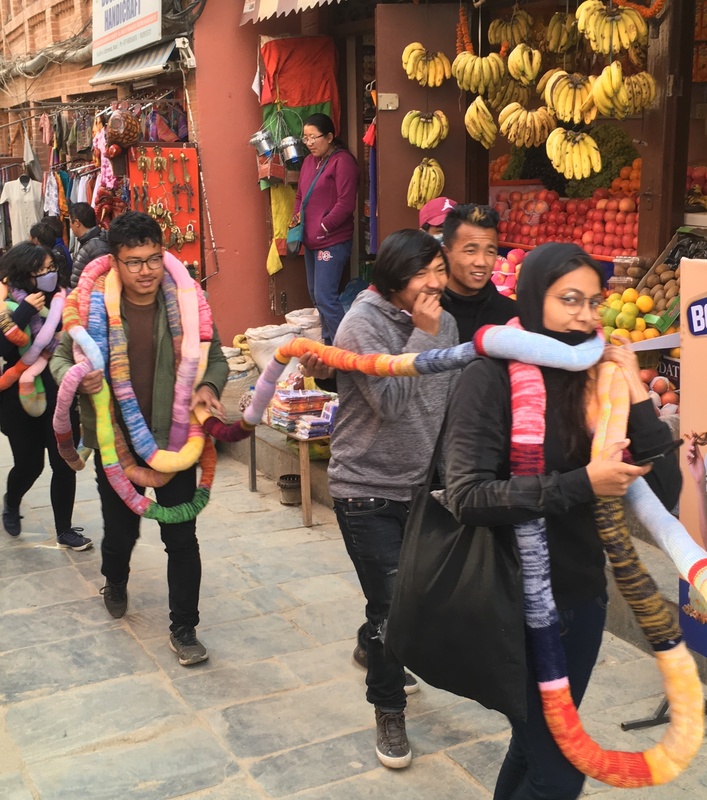 Project 1336 is a community-based art project, designed by Manish Lal Shrestha, and named after the altitude of Kathmandu in meters. It works with the diverse community of Kathmandu, especially women and youth. Life is never straight; it is like the lane of the Kathmandu Valley. I see women gathering in small courtyard knitting along with their neighbors’ interaction with joy about life and values. They knit with the stories, and knitting becomes the story of seconds. Knitting is like making things happen, intricate connection between threads and journey of life, which is yet full of struggle, hope, and chaos like the lanes in the city. 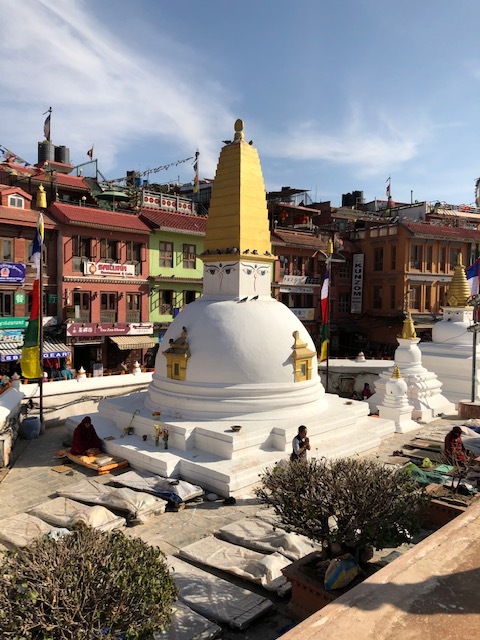 Today happened to be a beautiful, sunny day at Boudhanath Stupa in Kathmandu. This stupa is located on an ancient trade route from Tibet to Lalitpur. At 118 feet tall, it is one of the largest Buddhist stupas in the world. We had a lovely lunch at Flavours restaurant across from the stupa. Then, while strolling around the stupa we happened upon an amazing sight. 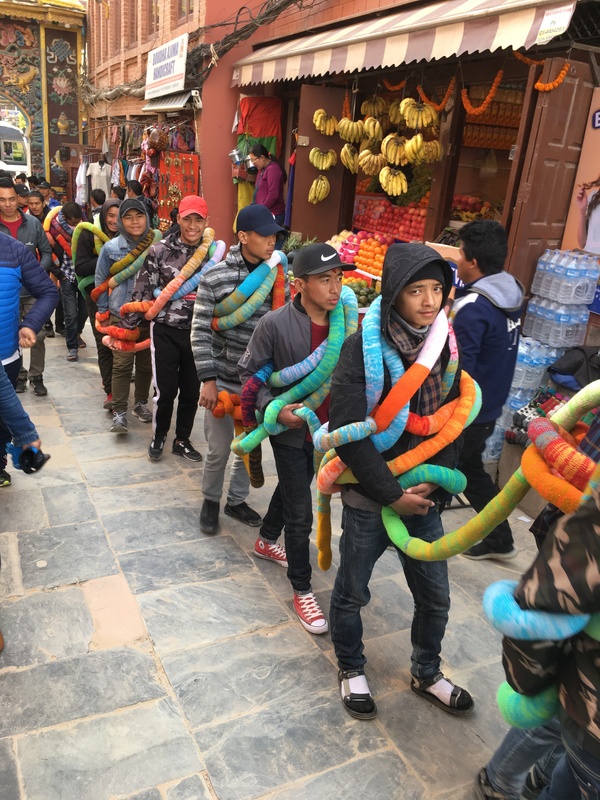 A public procession of a 1336 meter long, knitted snake was being enacted. It appeared to require 1336 people to carry it along with their big smiles. We were fortunate to be standing next to a friend of Manish, the designer. She provided an explanation of what we were experiencing, but we still couldn’t quite believe it. This entry was posted in Cape Cod and tagged art, community, Nepal, stupa. Bookmark the permalink. What other use will this tightly knit snake have after its presence in the ritual? What an amazing adventure you and Susan are. Having . Very. Cool. That snake is pretty amazing (and beautiful) — when I started reading I pictured something like a very long scarf, but this is tightly knitted and filled with something. Interesting that it is being carried mostly by men, at least in these pictures.